Leave that to the hoverboard. For Nike, yesterday was the culmination of a passion project which began in 2007. It was then that iconic designer Tinker Hatfield, who is behind the most popular Air Jordan models, took on the task of creating an innovative shoe based on the one worn by Marty McFly (Michael J. Fox) in Back to the Future Part II. 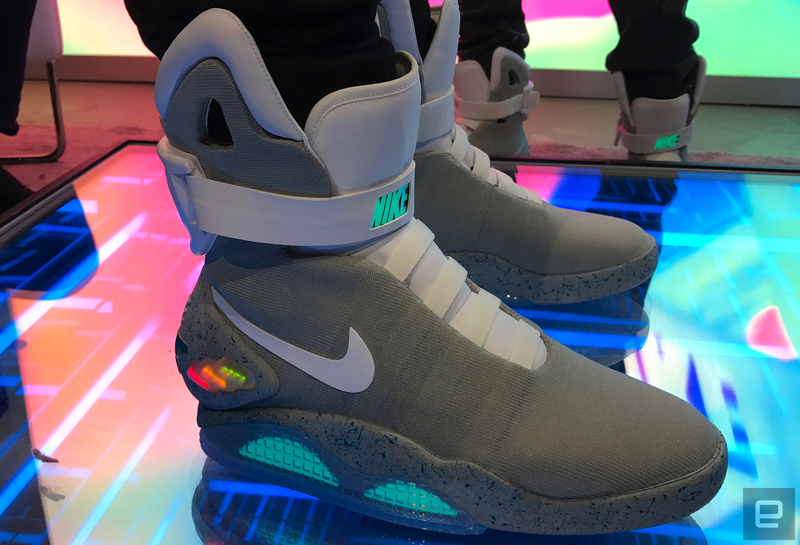 Now, as demoed by Fox himself last year, the Nike Mag is finally more than a film prop, thanks to a self-lacing technology the sportswear giant calls "Adaptive Fit." This is the same pair Nike is giving people a chance to win through an online raffle. Tickets are $10 each and all proceeds are going to The Michael J. Fox Foundation, an organization that's trying to find a cure for Parkinson's disease. But, I know what you're wondering: "Are they the real deal?" Well, I had the chance to try on a pair last night at a private Nike event in New York City and I'm happy to report they didn't disappoint. While brief, the experience made me feel like Nike's other self-lacing shoes, HyperAdapt 1.0, can't come soon enough. After being escorted into a glowing room, a Nike employee wearing white gloves brought me a Mag size 11 and very carefully placed them on the floor for me to wear. I'm actually a size 10.5, but since the company only made it in men's 7, 9, 11 and 13, it recommends selecting the next size up. The first thing I did was admire how much more stunning they are in person (though I say that anytime I try to find an excuse to buy a sneaker), especially compared to the version from 2011. Everything on this silhouette, from the midsole to the upper, feels premium. Once I slipped my right foot in the shoe and as soon as my heel touched the insole, the Mag's power-lacing mechanism kicked in. At that moment you really do feel like Marty McFly -- if only we had actual working hoverboards (no, not those). There are three buttons on the inside, colored red, yellow and green, which let you adjust the tightness of the laces. They're also used to light up the LEDs across the midsole, the area that displays how much battery is left on your shoe. Surprisingly, the Nike Mag is quite comfortable. Based on its extreme high-top design, I was expecting it to be heavy and clunky, but thankfully that wasn't the case. In fact, without looking, I wouldn't have been able to tell the difference between the Mag and Air Jordan 1 I arrived with. That was the biggest surprise as I walked around in them. The bad news is there's a slim to none chance I'll ever own the Mags. Nike is only making 89 pairs available to the public, so if you don't win the raffle expect to see them on eBay for somewhere in the $20-$30k range. For context, the 2011 Mag, which lacked Nike's Adaptive Fit tech, go for anywhere from $8,000 to $12,000. But, I suppose that's the price you have to pay if you want to look like you're from the future. And don't forget, you only have until October 11th to enter the contest.